Norman Bates. What does this name evoke for you? Perhaps a shower scene, blood, or a motel? Maybe Mother? Norman lives in the house on the hill above his motel off the old highway. Travelers take the new highway that is a far distance away from the motel, so Norman rarely gets a guest to stop by and stay. Except for Mary. Mary's escaping from her job, the boredom of her life, and with forty thousand in cash that she stole from her sexist boss. She's taking this money to see Sam, her fiance, and she's trading in one used car after another to throw the police and others off her tracks. It's not like her to do something like this -- after all, she's given up her own future to make sure that her sister, Lila, gets to go to college, and succeeds with more opportunities than Mary ever had. Less than twenty miles from her fiance's town, Mary decides she'll stop to rest at a small motel. She'll get much needed sleep and freshen up. Tomorrow, she'll surprise her fiance with a made-up inheritance story and help to get him out of debt so they can marry. Unfortunately, she's picked Norman's motel to stay the night. You may know the rest. There is the famous shower scene and screams of the beautiful young woman as she is literally hacked to pieces. The story then continues with Lila visiting Sam to see if he's heard from Mary as it's been over a week since her disappearance, and together they try to track her down. It's a short story at around 175 pages, and in this short telling, it is without a doubt, utterly terrifying. Particularly when the story is told from Norman's perspective. He's quite an innocent, and his blackouts are written so genuinely that you truly do believe that Mother is really the problem. But the problem is that people think Mother's been dead for twenty years. An astute study in the question of when -- when does a person like this become who they are? Who shapes them to be this way? In several ways, it's a dated book, but overall, it feels strangely fitting even reading it today. 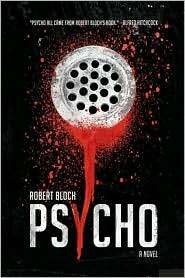 Robert Bloch's tale of terror is frightening in its simplicity, and incredibly disturbing in several sections. Had I read this story (inspired by the true life of Ed Gein) during the creepy month of October, I daresay I would have slept much. No wonder Hitchcock brought this story to a visual medium. Really? Only 175 pages. I'm terrified of just the thought of reading it. Even the cover is creeping me out. I knew this was a book but never really thought of it as a book,odd. I think I'll have to give it a try at some point. I never knew this was a book, but I should have figured it out. The movie terrified me, so I'm not sure I'd want to read it. I read this book a few years ago and it is creepy! Although, it felt more like a psychological thriller than horror. Nice review. I will definitely read this book. Great choice for a nice day when I am all alone at home... not! love your review--and thanks so much for the link! Great great great review, definitely adding to Wishlist, sounds fantastic. I forgot -- if I ever knew! -- that this was a book first. I never saw the original (I am chicken), but one time when my friend and I were doing logic homework, we had the remake on mute in the background. Scary movies are far less scary when you're reading the subtitles and the sound's turned off. "Mother! No! Blood! Blood! Mother, no! Blood! Mother!" I think the book is probably much scarier than the movie. Having Norman's perspective is no doubt fascinating. Not sure if I could brave this one. This was such a creepy movie! I've never read the book, but I'm guessing it's even more creepy than Hitchcock's movie. Is that right? By the way, I love your blog's new look! I have seen this movie, but had no idea it was also a book! I am going to have to read this one to compare the two, but I just know it's going to give me nightmares. Great review, by the way. This is indeed a terrifying story! Just watched the movie for the first time in years, and it still holds up. I think my daughter is the afficionada of spooky movies and she gave it two thumbs up. I did not realize it was a book, but it makes sense. Great review! I somehow had no idea Psycho was based on a novella! I know I'm one of the few people who actually liked the remake too, and I may have to read this one! I honestly didn't know this was based on a book!! It would be creepy to read things from Norman's point of view. And I don't think I realized that she had stolen money. 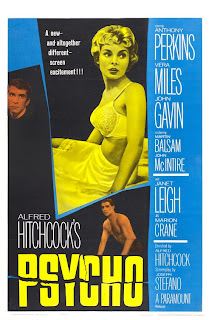 Naturally, this is on my Hitchcock list as I'm endeavoring (over time) to read all the books that inspired Hitch's films. I read somewhere that he disliked the book which has kind of intrigued me. That will make reading it all the more interesting. Who can ever forget the shower scene and the close up when we discover who / what remains of Bates mother....chills down my spine just thinking of it. I've never read this one but the movie sticks in my mind! I'll have to add this to my list to read when I feel like being scared by what I am reading! I never realized it was a book either until seeing a few other bloggers read/review it -- and do believe me when I say that it is very creepy when the story switches and is told from Norman's perspective! Disturbing, to say the least!